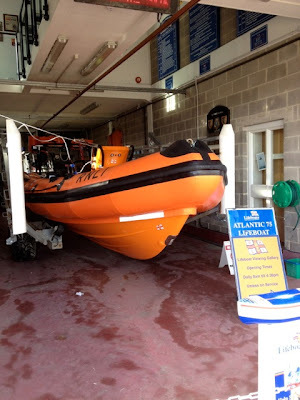 At the Great British seaside there are a few constants that you will see pretty much all round the coast - the first is changeable weather, the second is Lifeboats. Essentially they are the super-charged version of the coastguard and able to brave even the roughest seas to rescue people when the changeable weather hits. Whether you've been caught out by shifting tides and had to dash back to the main beach before being cut off, or just seen Blue Peter's (UK kids TV show) excellent efforts to raise awareness and money then most people are familiar with the perils of the sea-side. I was completely oblivious however to the fact that they have a charity tea! 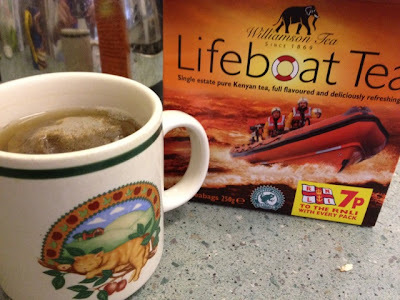 I'm a sucker for tea-with-heart as the Builder's Tea (that pays for training unemployed youths as builders) review shows, but lifeboats are a little bit special. It's the kind of service that is pretty much run by volunteers and donations and puts these brave people in danger on a regular basis. The pack details the exploits of rescues that were pretty close to the edge, and makes you feel guilty for hiding inside with a cuppa. 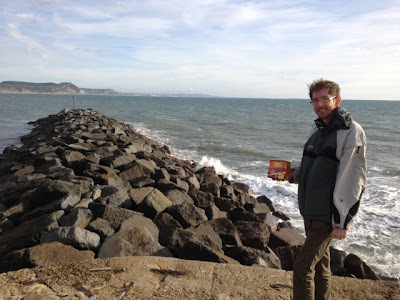 To this end I got Ms. NLi10 to take a quick snap of me on the Cobb (sea-wall) at Lyme Regis in November - it's as windy as it looks (if not more so)! The product itself is a really good quality tea. It's not going to win awards for its exciting flavour, but it's an amazingly smooth English Breakfast style blend and well balanced. I've been happily choosing this over PG Tips when having a caffeinated tea (my default is decaf these days) and plan to buy more. My only problem with the product is it's charitable status - only 7p from the box goes to the lifeboats. Looking at the picture below 7p doesn't go very far at all, and I guess the positioning of this is so that the price of the box doesn't prevent people from buying it for cheaper brands (it was reasonably priced). So my suggestion is this - hunt down the tea for a taste next time you are at the sea-side but put a little extra in the collection box too. If someone was collecting for the lifeboats in the high-street I'd feel ashamed to just give them 7p, but I suppose that en masse all these coins add up quite fast. The quality of charity snacks has improved a lot over the past 10 years or so, with no compromise being made on quality, and this tea can be added to the list of quality foods that just happen to be charitable - bringing me to my next point. Here at FoodStuffFinds we do like good snacks, but we also like good causes. I'm sure that some of our readers have favourite charitable snacks that are actually of high quality, like Lifeboat Tea, or the Red Nose Day Dubble Chocolate bars - what I want you to do is to put a comment about them below ESPECIALLY if you think it's something we haven't mentioned but don't know about. There must be lots of small local charities doing snacks that would appreciate a few thousand extra visits to their website and I'd be happy to hunt down the foods to try out. January can be pretty quiet for snacks so if you want us to give your favourite a shout out then now is your chance. The American Girl Scout cookies (http://www.girlscoutcookies.org/) sold before Christmas are my favourite charitable snack but sadly not available in this country! If you have any contacts in the US who can get hold of some for you, the coconut and caramel 'Samoas' are amazing... good enought that my wife had a go at making home made versions this year! I've only heard of those because of the Simpsons!! Wonder if there is a similar initiative in the UK? Would it have to be biscuits over here?